Welcome to Hippity Hop Bounce! The personal touch customers are looking for is found at Hippity Hop Bounce House Rentals. 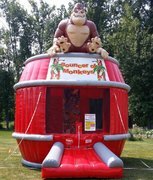 Our family-owned business rents out bounce houses and other party supplies to customers in Erie and Niagara County, Akron, Alden, Amherst, Bart, Buffalo, Blasdell, Boston, Cambria, Cheektowaga, Clarence, Depew, East Aurora, Elma, Grand Island, Hamburg, Kenmore, Lancaster, Lackawanna, Lewiston, Lockport, Niagara Falls, Orchard Park, Pendleton, Sloan, Tonawanda, West Seneca, Williamsville, Wilson, Wheatfield, Youngstown ,and all over Western New York. 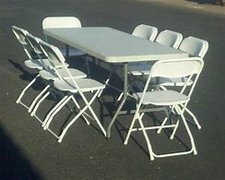 Our mission is to make sure each and every customer is completely happy with the party rentals we've provided for them. Great company!!! 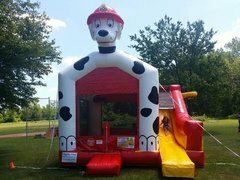 I booked the side by side slides for a summer party, this was a hit with not only the kids but also with the adults. It definitely was the hit if the party. I will be ordering this again for my next party. Set up was easy and fast, they did it all you do nothing but enjoy. 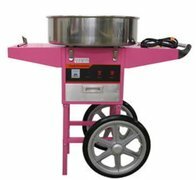 I have used this company for my event for the past 3 years and I have never been disappointed! Inflatables are a great size/quality for the price. The customer service is FANTASTIC! Delivery/pick-up is always on time and there are never any hidden fees! I highly recommend Hippity Hop! Love this company! Had the dual slide for my son's grad party last summer. Was a HUGE hit! People still talk about how fun & unusual this inflatable was! Great customer service. They were in & out in no time with set-up & take down. Very professional. I highly recommend! You will NOT be disappointed!